Black garnet color. Earthy aromas and flavors of dried berries, twigs, marinated root vegetables, and raw meat with a lean, flat, bone-dry light body and a short finish with accents of pomegranate vinaigrette, newspaper, gravely earth, and bark with firm, dusty tannins and heavy oak flavor. A dry, very earthy and tannic red for game. Bottom Line: A dry, very earthy and tannic red for game. 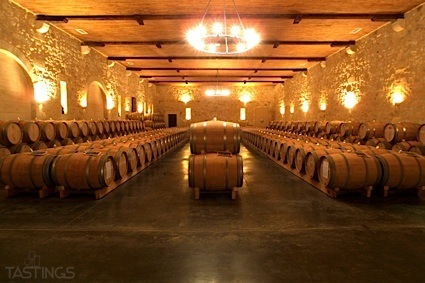 Petit Verdot is a red Bordeaux variety, one of five permitted in a Bordeaux classified wine. It is almost never seen as a stand-alone variety in this region, instead it is a blending component, used primarily to add color to the wine. The grape's deep, inky purple hue is quite remarkable and perhaps for that reason, it has attracted a handful of producers in California as a stand-alone wine. It is also used in small amounts as a blending grape in certain powerful California reds. The grape is also grown in Chile and Spain. The flavors are of blackberry, black cherry and plum along with light black spice. Tannins are moderate as is acidity. Pair a Petit Verdot with robust dishes, be it game birds or venison. 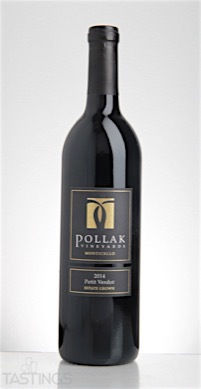 Pollak Vineyards 2014 Estate, Petit Verdot, Monticello rating was calculated by tastings.com to be 81 points out of 100 on 9/24/2016. Please note that MSRP may have changed since the date of our review.